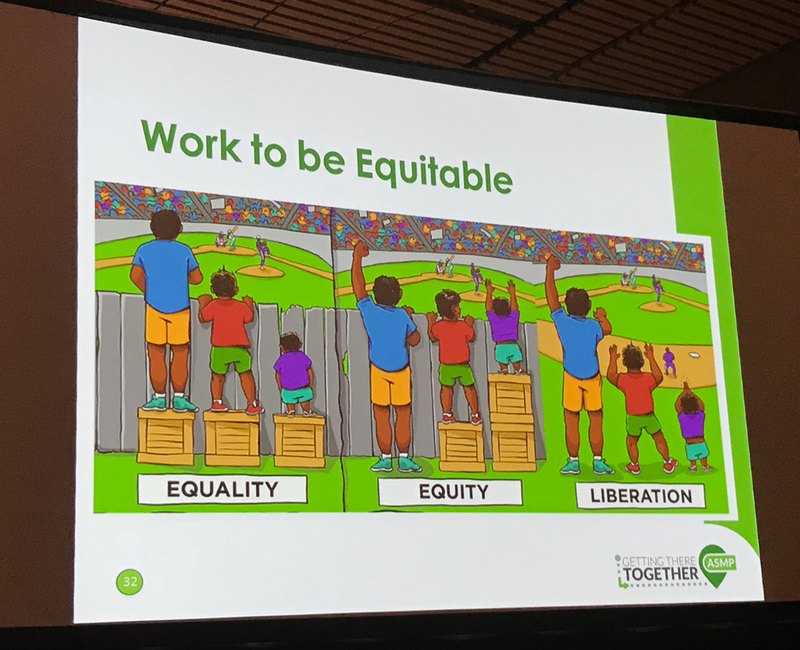 The first day of NPC18 was jam-packed with an inspirational opening keynote, sessions that got attendees talking on equity and engagement, and volunteer opportunities and mobile workshops in New Orleans and the region. Read reactions on what you enjoyed (and catch up on what you may have missed) from Saturday, Day 1 of NPC18! Miss it or want to catch it again? Watch his full address below. Numbers from the NPC18 App indicated that “Back to Basics: Walkable Suburbanism” would be one of the most popular sessions, and that proved to be true Saturday. A full room of attendees learned about using tried-and-true planning solutions in new contexts to provide vision for the evolution of suburbs from a panel of speakers representing academia, the public sector, and a private firm. The message? Creating walkable spaces in the suburban environment relies on several key elements: building community and civic spaces; including residential components to provide vitality beyond workday hours; ensuring anchor restaurants are local and authentic to the community; and using good design that prioritizes interesting architecture and walkability. Faced with increasingly congested roads and a population expected to double over the next 30 years, Austin planners have set about creating the Austin Strategic Mobility Plan — the city’s first locally focused transportation plan that considered all modes of mobility. Through this process, the project team created a community outreach strategy aimed at removing barriers to reach populations that find it difficult or intimidating to actively participate in formal planning efforts (cultural, time, money, communication, mobility, etc.) in order to create an effective — and equitable plan — that represents all residents. Attendees learned that different strategies are needed if they want different results. A few recommendations included reaching out to residents at their own level (work, school, church, and other community events) they will already be) rather than making them come to you; simplifying how planners talk about planning topics and avoiding complex language, planning jargon, and acronyms; and making a concerted effort to provide communication materials in languages other than English, as well as making them accessible for people with vision and hearing impairments and disabilities. While it might require a little more effort, time, and a bigger piece of the budget to focus on underserved communities, it is necessary to ensure their voices are heard. Panelists engaged a packed crowd as they shared strategies and challenges from living in some of the country’s most creative cities in addressing housing affordability. From Denver, Nashville and Portland, they gave an overview of how the issue has evolved over time, noting some of their commonalities. Attendees had the opportunity to hear some innovative housing solutions to make change in their communities. The AICP Community Planning Workshop kicked off in the Treme neighborhood today at the Sojourner Truth Neighborhood Center with welcoming remarks from State Representative Royce Duplessis (District 93). Twenty volunteer planners met with residents, developers, and other stakeholders to discuss strategies related to increasing affordable housing and preserving the character of the neighborhoods along the Claiborne Corridor. The elevated expressway (I-10) along Claiborne Avenue has negatively impacted the African American neighborhoods for over 50 years. Participants in the AICP Community Planning Workshop in the Treme neighborhood. Photo by Ryan Scherzinger, AICP. 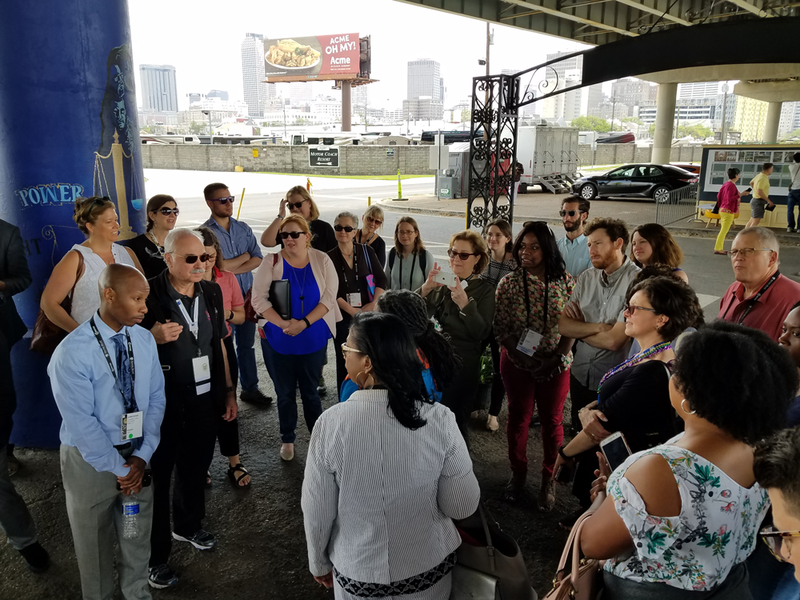 The planners toured the new Lafitte Greenway and experienced the new Cultural Innovation District (CID) a newly activated space under the highway that had its ribbon cutting just yesterday. Focused discussions on accessory dwelling units and parking will contribute to HousingNOLA and the City Planning Commission’s efforts with the Claiborne Corridor community amid dynamic changes in the city. Another packed session — panelists from Austin, Chicago, Salt Lake City, and Brownsville, Texas, discussed causes and effects of gentrification in various Latino communities across the country. The takeaway? Planners and decision makers need to work more closely with affected communities to ensure that improvements such as elevated trails don’t cause existing residents to be priced out. "We started the Dutch Dialogues with a bit of arrogance." Three Dutch Dialogues were held in New Orleans post-Hurricane Katrina, supported by APA, local partners, and the Dutch Embassy, to bring a new model for water management in flood-prone cities. While some thinking has changed as a result of that work, cities continue to rebuild massive flood control structures under old paradigms, rather than moving towards a Dutch model that includes changing the landscape profile to include floodwater storage. Calls for streamlining zoning codes in communities are not new. Still, there is little consensus among planners and decision makers about how best to put zoning on a diet. In Saturday’s “Should Zoning Be Simple” session, speakers Derick Berlage, AICP, and Lee Einsweiner unpacked the history and nuances behind zoning reforms and discussed how new approaches to simplification like lean urbanism have potential to be game changers. #NPC18 was trending in New Orleans on Twitter as planners shared their learning and experiences on social media. See what was driving the conversation online on our Tint feed below and by following #NPC18 across platforms. Attendees finished off the first day of the conference with the sold-out Welcome Reception at the National WWII Museum. Top image: Planners at the NPC18 workshop “Building Blocks of a Sustainable Community.” Photo by Linda Reineke, Riverview Photography.